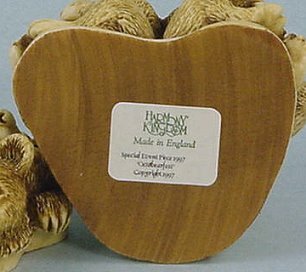 "Oktobearfest" was an historic milestone for Harmony Kingdom ... this is the first Special Event piece released for in-store promotions. 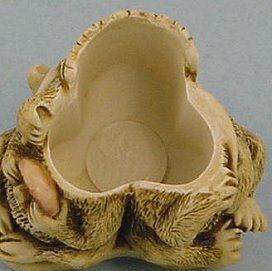 This box was only available at select dealers during October and November 1997. 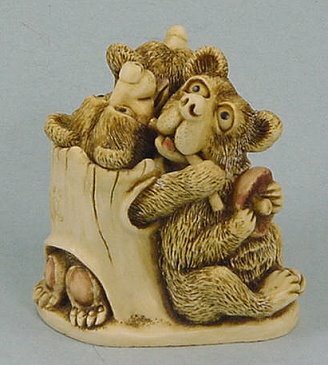 "Oktobearfest" is a celebration of Autumn, with Peter's three bears enjoying a frolic in the forest before their long winter slumber. The tree stump around which the bears play is inscribed with the Calvesbert family tree. "JC", "MAR", and "1816" represent John Calvesbert, who married Mary Ann Rudland on Christmas Day 1816. Inside the box is a South African 10 cent coin from Peter's honeymoon. 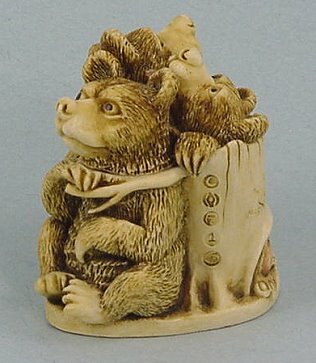 Peter's mouse is hiding between two of the bears. This Treasure Jest comes complete, in green box, & has never been displayed. "Queenie and Prince Charming Set"